Ready to learn more about new trends in ag? 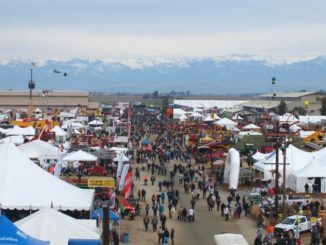 Be sure to catch a seminar or two at World Ag Expo®. Seminars are free to attend and cover a variety of topics ranging from Dairy and Irrigation to Marketing and International Trade. Industry specialists will share trends, studies and ideas on how to increase efficiency in your operation. Food is now a statement on who we are and our core values. In a plant focused food world rife with misinformation, how do we continue to make milk and dairy foods relevant? See the research, innovative tools and programs we’re using to market California dairy products. What is Driving Producer Prices in a Post-CDFA World? The California Federal Milk Marketing Order (FMMO) was implemented on November 1, 2018. How do the new roles governing milk pricing and pooling impact producers? Will the pricing changes affect the current economic environment? Attend the seminar for a discussion of the new FMMO. California’s political landscape is changing and leaving the producers of food and fiber behind. There are ways producers can adapt and learn how to play offense. This seminar will showcase current consumer trends and how they affect legislative priorities in the state. There will be a heavy emphasis on opposition research and how it has a role in the changing political landscape for agriculture in California. Come hear the latest updates in regulations and implementation strategies that will affect your dairy. California and Canada dairy farms are paid dramatically different prices. The California Dairy Campaign will host a discussion of a sustainable milk inventory management system among dairy farmers from Canada and the United States. The seminar will discuss what dairy producers should expect from their dairy cooperatives, including Board responsibilities, state and federal co-op laws, and co-op marketing agreements. The discussion will end with suggestions for dairy producers to improve their producer pay price. There is confusion in the media about the impact livestock supposedly has on our environment. This presentation reviews how the efficiencies in livestock production and environmental emissions are related, and how our producers are leading the way to a “greener future” for California and U.S. agriculture. It’s not about: new robots, building new barns, replacing employees, loan renewal or even new technology. A total dairy makeover is about getting excited about your Dairy again and how it results in profitability! Heat stress not only impairs lactating cows, it also challenges dry cows and their calves. Dry period heat stress negatively affects the performance of dairy cows during the subsequent lactation and weakens immune status and harms mammary gland development. Learn the result of studies that compares cooled dry cows versus shaded dry cows to find the best way to care for your herd. University of Florida, Animal Science Dept. Taking a systems approach toward managing the interconnected parts of the dairy operation using data and cow-based observations, Dr. Jeffrey Bewley brings years of practical dairy industry experience to help farmers improve profitability. High-component producing cows have one thing in common: a fully developed rumen! This information packed session will explain how achieving higher levels of component production begins by focusing on better rumen development. Dr. Shane Holt shares valuable data and management insights from Western dairies that explains why rumen development is the critical first step in developing a high-component producing cow. The management of manure in storage lagoons is one of the most difficult, expensive and potentially limiting problems facing the agricultural industry today. Manure management costs are high and add nothing to the bottom line of a large livestock operations. In the fall of 2018, a California dairy was the first to have their LWR Manure Treatment System funded under the State’s Alternative Manure Management Program. Learn how to do the same for your operation. With ever-changing market demands, producers need to constantly improve cow care standards on their dairy. But there has always been a missing piece to the puzzle – information coming directly from the cows. Now, with livestock monitoring solutions, producers can make better decisions when taking care of cows on a individual, group, and herd level with the information gathered through wearable sensors.